Background: Acute appendicitis is one of the common conditions requiring emergency surgery. A retrospective study was performed to determine various histopathological diagnoses, their demographics and the rates of perforated appendicitis, negative appendectomy and incidental appendectomy. 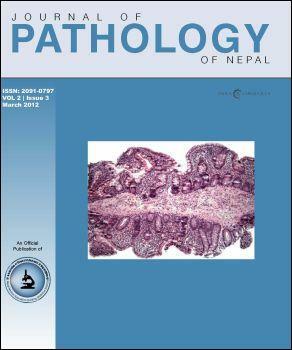 Materials and Methods: Histopathological records of resected appendices submitted to histopathology department Chitwan medical college teaching hospital over the period of 2 yrs from May, 2009 to April 2011 were reviewed retrospectively. Results: Out of 930 specimens of appendix, appendicitis accounted for 88.8% with peak age incidence in the age group of 11 to 30 yrs in both sexes. Histopathologic diagnoses included acute appendicitis (45.6%), acute suppurative (20.8%), gangrenous (16.3%), perforated (1.7%), resolving /recurrent/non specific chronic appendicitis (2.5%), acute eosinophilic appendicitis (1.2%), periappendicitis (0.2%), and carcinoid tumour (0.1%). Other important coexisting pathologies were parasitic infestation (0.2%) and Meckel’s diverticulum (0.2%). Negative appendectomy rate was 10.8% and three times more common in females with peak occurrence in the age group of 21-30 yrs. There were 10 cases of acute appendicitis in incidental appendectomies (2.5%, 24 cases) with 7 times more common in females of age group of 31- 60 yrs. Conclusion: There is a high incidence of appendicitis in adolescents and young adults in central south region of Nepal. Negative appendectomy is also very common in females. Incidental appendectomy in elderly females may have preventive value.